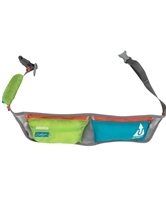 I’ll be honest, I was a little hesitant to try out the Jurek Essential for the simple fact that I hung up my cumbersome waist belt a couple of years ago and made the decision that waist packs weren’t for me. I’m beyond happy that I stepped out of my comfort zone to buckle this beauty of a waist pack on! This light-weight pack is everything you need in a waist pack, it has 2 larger pockets on the back, one of which is waterproof (thumbs up from this Vancouverite) and one smaller key pocket on the front. Plenty of storage for all of your running goodies! The specs: Weighing in at a feather-light 2 oz, this little beauty has two zippered pockets, one made out of silnylon for waterproofness, and the other made of flexible mesh for optimal storage capability, both pockets are big enough to accommodate an iPhone, nutrition, ID, etc… There’s also one small velcro-secured pocket which is big enough for keys, or ID. The belt is made of 3/4″ waist webbing with a stretch panel and has adjustable race bib clips. The belt itself comes with plenty of extra strap and is fully adjustable. Packed with all my goodies! What I liked about it? I had concerns about feeling like I was wearing a belt, but with the Jurek Essential, I really didn’t even feel like I was wearing anything at all! There was no jiggling, or flapping or slippage, the pack fit great and laid flat against my lower back. The waterproof pocket is my favorite feature of this belt by far. Being a Vancouver girl, it rains here often (all the time), especially at this time of year (any time of year) 😉 . I carry my iPhone with me to snap pics, and I usually have to stow it in a ziplock baggy or leave it in the car when it’s raining hard. I tested this belt out on one of Vancouver’s rainiest days and my iPhone was completely dry! The interior of the waterproof pouch was dry as a bone, not a drop of moisture at all! LOVE THIS THING! I also really loved the stretch mesh pocket, it fits way more than you may think. I was able to jam in 3 GU’s, and a Pocket Fuel and there was still room for more. Zipped and ready to go! There really isn’t too much that I didn’t like about the Jurek Essential. I guess one of my gripes is the sizing of the front velcro pocket. It is made to stow your keys or credit card, etc… but it’s pretty tiny! I was able to get in my car keys, but that’s about all I could really jam in there. I’d like to see it a tiny bit bigger. My next grip isn’t really a grip, more of an observation. The strap comes with a very long extended strap, so it’s suitable for all sizes. The problem I had was that I had it cinched down as small as it could possibly go, which worked fine for me, but if you’re any smaller than I am, this belt may be too big for you, even on its smallest setting. 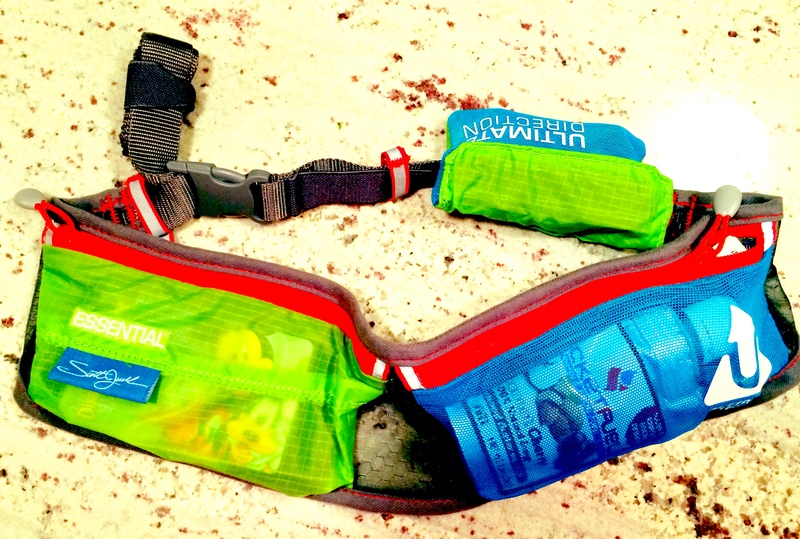 All in all, this waist pack is a HUGE winner in my books! I’ll continue to use this in conjunction with my handheld water bottle to carry me through my long runs. Don’t let the fanny-pack-esque look of it fool you, this is a total badass pack, that is functionally amazing! Have you guys tried running with a waist pack or a belt before? What are your thoughts? color, I love the bright color option! WATERPROOF pouch! A life saver! Jurek Essential provided for review by Ultimate Direction. I really didn’t like this belt! I wanted to, as a fan of Jurek and wanting a water-proof pouch for my phone. But the only way to wear it even close to comfortably is high on the waist and tight. If you wear it low on your hips, it bounces like crazy due to the pouches hanging off the strap. As for the strap, only a couple inches are elastic. So there is little room between being too tight and loose. Once the elastic is stretched to it’s limit, which isn’t much, it’s pretty much just a nylon belt. Most other belts on the market stretch for the entire length. I sent it back and got an Altraspire Quantum. 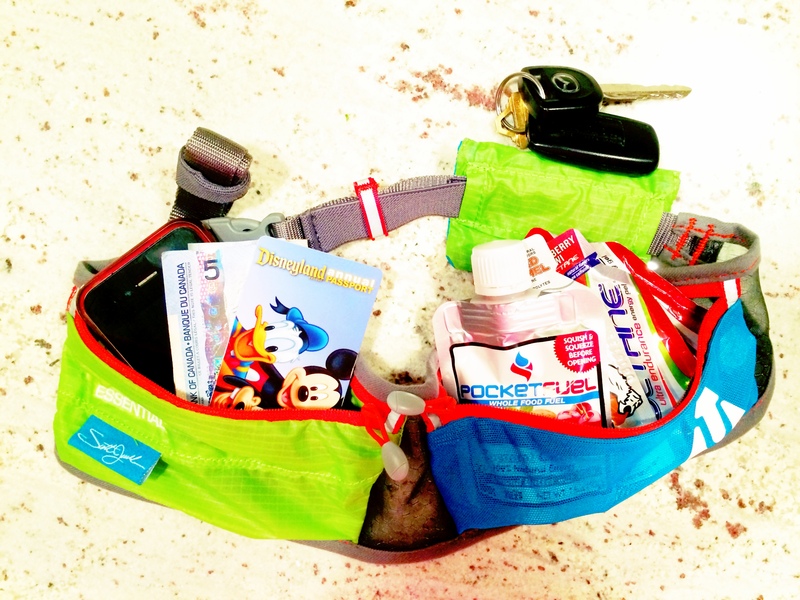 Which is great, but not as many pockets which aren’t as versatile and the “water-proof” pouch is anything but. My phone gets covered in sweat. Ahhh!!!! MLL, thanks for the review an input. While I’m not new to running I am new to distance running and being selective about gear. I have elected to run the 2014 SF Marathon and it just so happens to be my first marathon, ever. I have been debating about a belt vs H2O water bottle vs shorts with extra pockets, etc. You have provided what looks to be real world feedback about this particular belt. Like the reply above, I’m hesitant about any type of bounce. Also, I intend to run with headphones (not the entire way) and my phone (which holds all my music, run app). What is your opinion about carrying an iPhone in this product and running headphones up through the shirt? Any additional positives and negatives are much appreciated. Thanks for any additional feedback and hope your cryo epidermal injury recovers quickly.